After realizing that her tweet contained metadata showing it was sent from an iPhone, CNET asked for a statement from Gadot's publicist, who assured the media company on Gadot's behalf that she loved her "Huawei P20 and Mate10Pro." The iPhone tweet was deleted and several more ads were subsequently posted from an Android phone. 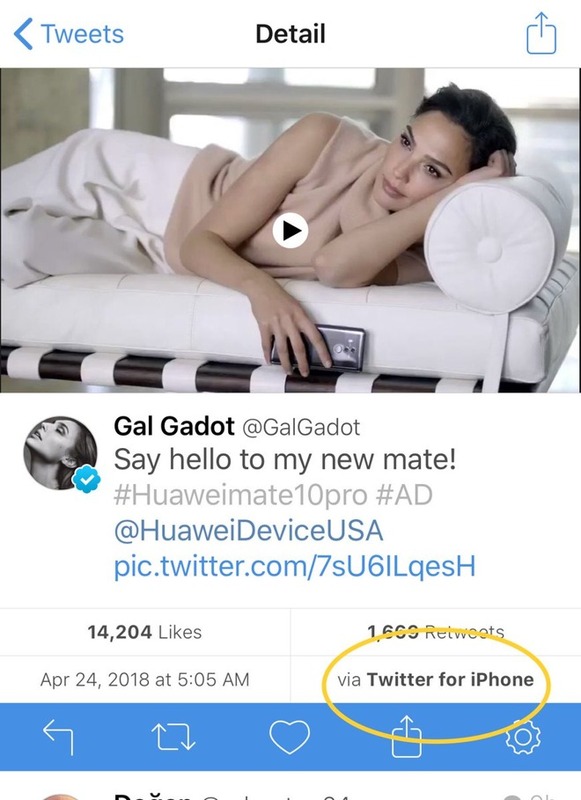 Gadot has been paid to be Huawei's brand ambassador since January, making her April tweet from an iPhone appear particularly sloppy for any advertising campaign. Gadot has since said that one of her staffers made the Tweet. Last May, professional tennis player Sania Mirza tweeted out "Not rly a techie, but totally love using the OnePlus 3T the past few months. More in my story onepl.us/a5 #oneplusstarcommunity." It too was sent from an iPhone. A long series of brand ambassadors tweeting from iPhones have plagued previous marketing efforts. Samsung created a fantasy soccer league in 2013 at the height of Peak Galaxy intended to "combine fans' universal love for football and GALAXY devices," but then the legendary leader of its fantasy team Franz Beckenbauer tweeted from his iPhone. Just prior to that, T-Mobile chief executive John Legere intended to use Twitter to direct attention to Samsung Mobile's latest Note 3 phablet, but inadvertently did so via his new iPhone 5s. The year before that, Oprah Winfrey used an iPad to send out tweets endorsing Microsoft's Surface, using the hashtag "#FavoriteThings" to say she had bought a dozen of them for Christmas gifts.